Alfie stayed the night, as he has been doing every Sunday since his mum changed her working days to the first part of the week instead of the latter part. Usually, Millie calls over and spends most of the day with him. They are growing close and are becoming great friends as well as cousins. The lady of the house was on nursery duty, so it meant I could have a little lie in after the busyness of the past week. It was about 8.15 am that I heard the first shouts of “Rog…Rog’ from the bottom of the stairs. It wasn’t the lady of the house calling me to get on with my chores, but my little friend Alfie wanting to play. 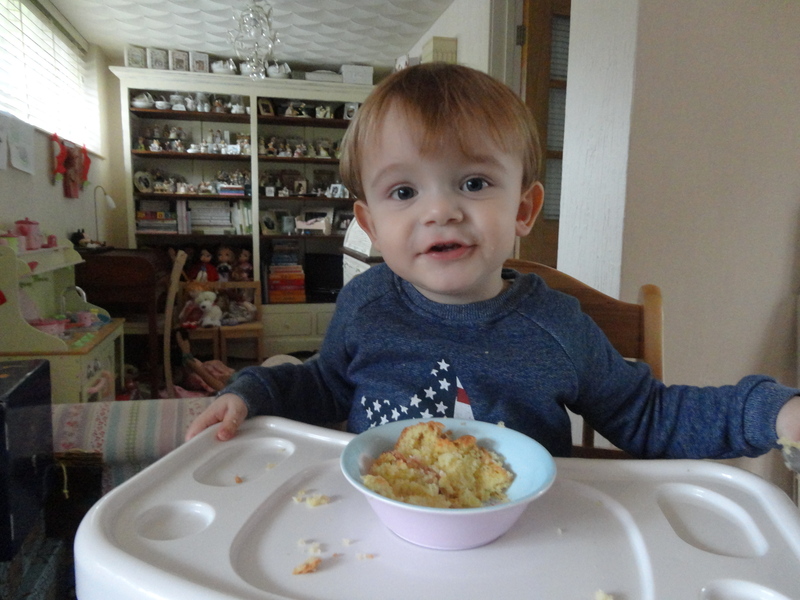 Some months ago, Alfie’s parents were teaching him animal sounds…. ”What does a cat say? What sound does a lion make and so on, until someone said, “What does Nanna always say? In response to this the whole family shouted….”Rog!’ … and from that moment Alfie has called me Rog. It’s kind of cute and I don’t take it as a mark of disrespect from the little fella. We were all excited about Millie’s visit today. We always love it when she comes to play on a Monday. 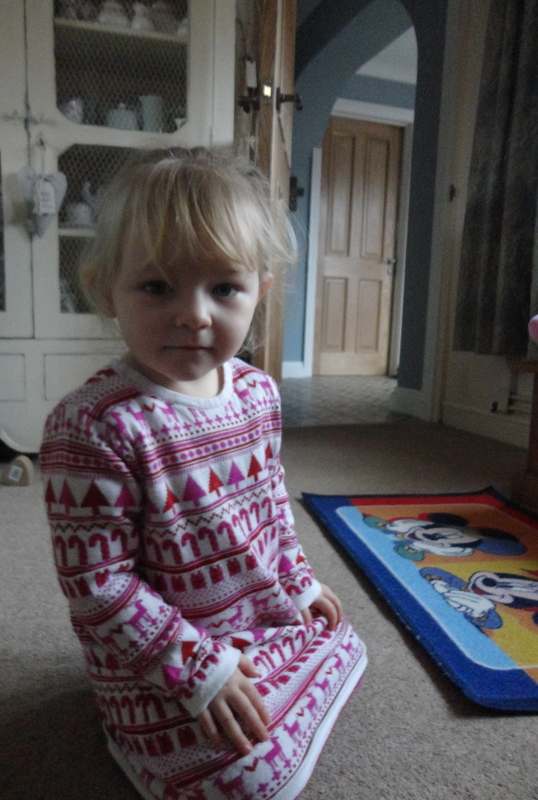 She came to our house just after dropping her big sister at nursery. 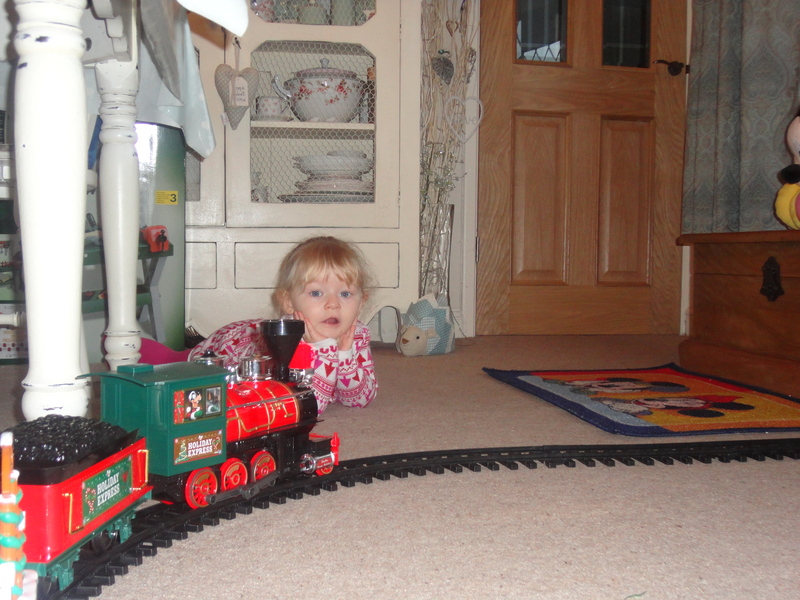 I think that she thinks she is coming to Disneyland Dinas Powys as she turns the corner into our street. The lady of the house had switched on the Christmas lights outside – her impression of National Lampoons Christmas Vacation – even though it was daylight. 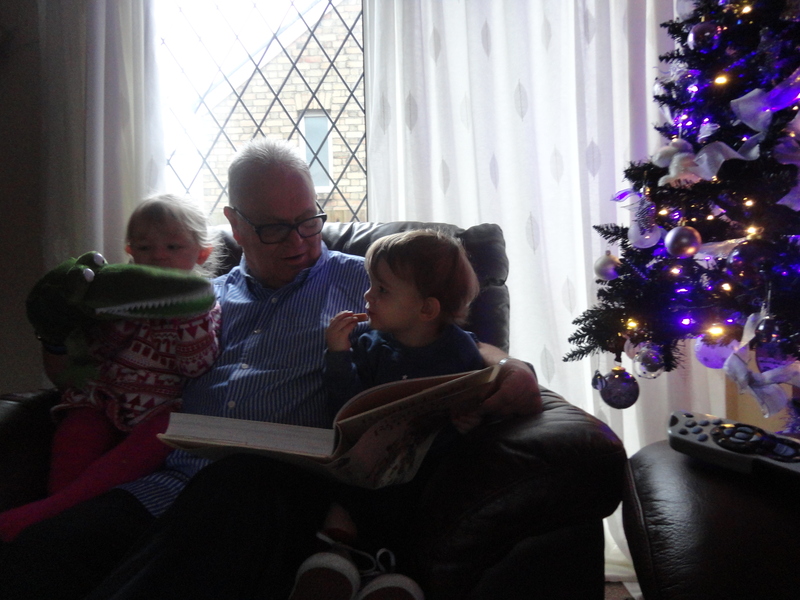 True, it was a dark and dreary December day, but once Millie and Alfie get together every day is a bright and happy one and I am sure she just felt the lights were an added bonus. Actually I am dreading the bill next time round, I am sure it’s going to be massive. I’ve been creative in thinking of ways to save money. Last week I was fed up of watching the fifteenth consecutive episode of Knots Landing on Sky plus, that I told the lady of the house I was going to the cinema. I told her to put her coat on and she asked if I was taking her with me? She didn’t look too happy when I told her that I wasn’t and that I was just turning the central heating off! It’s only fair… I am surviving on a pension! 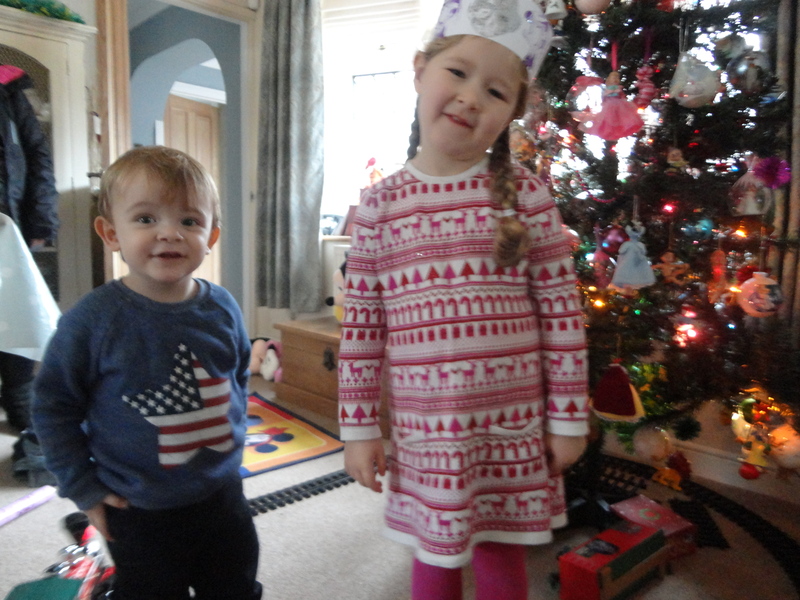 Today, both Alfie and Millie smiled broadly when they saw each other. We hope that when they grow up they will remember these happy and special times. 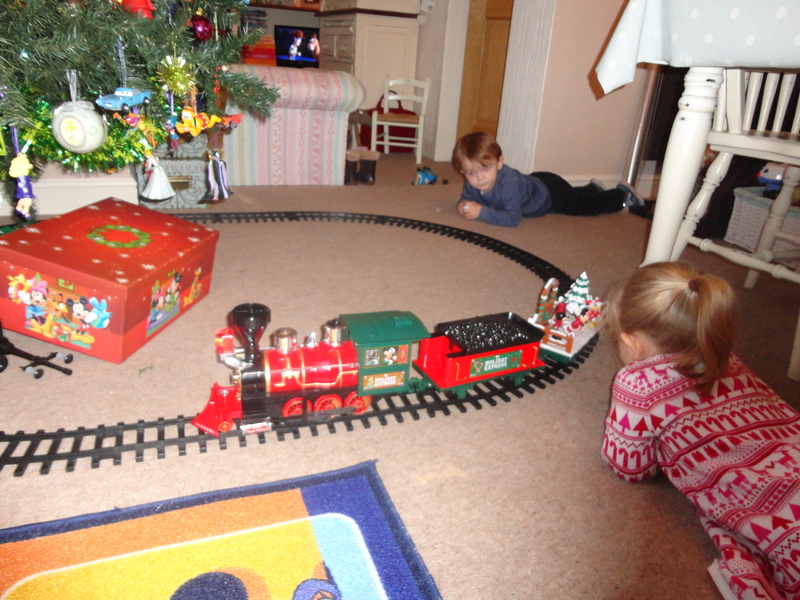 They played first with the Disneyland Express train set. This is the latest addition to the little piece of paradise that the lady of the house is creating for our precious grandkids. 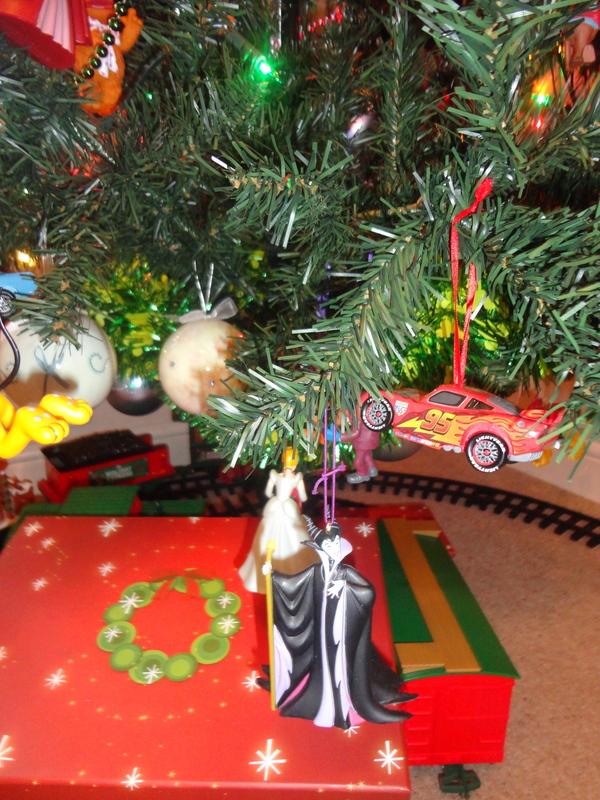 During December our dining room is transformed into what can only be described as Disneyland Resort Dinas Powys. 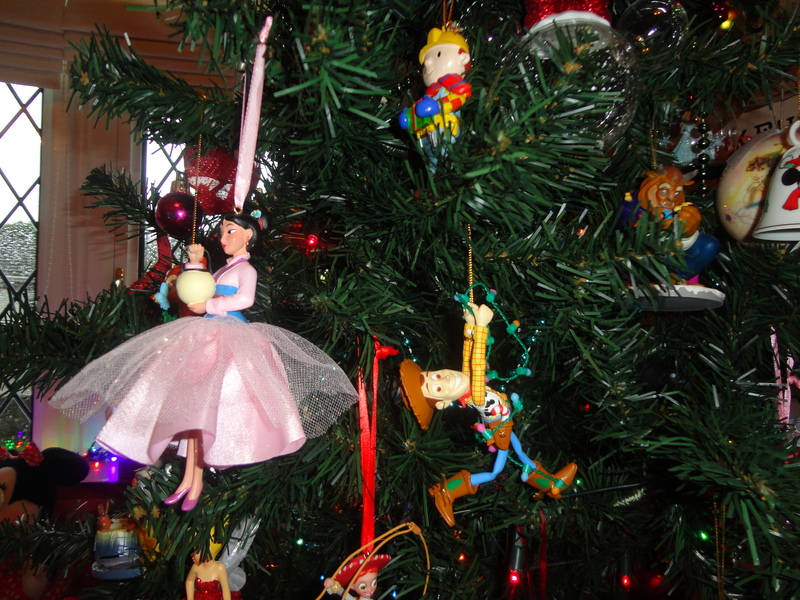 The whole room is decked out with everything Disney. 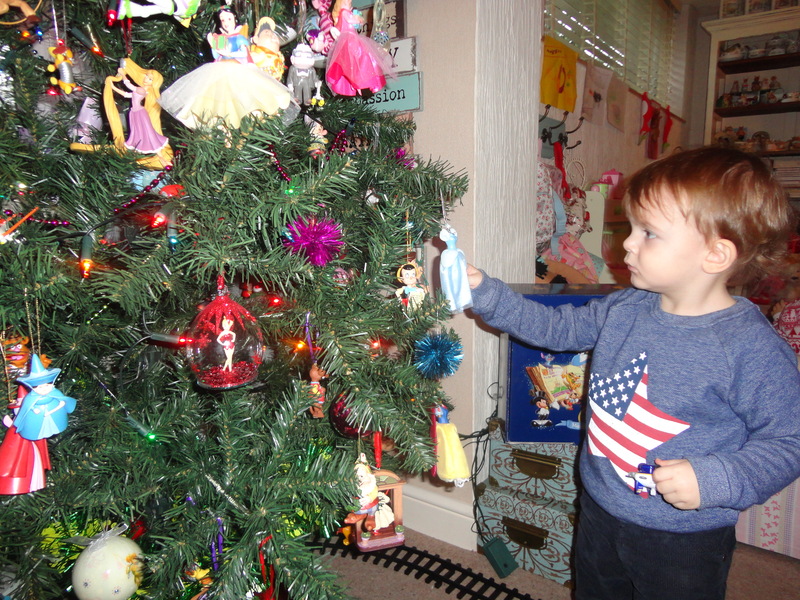 Soft toys, dolls, decorations… the lot. 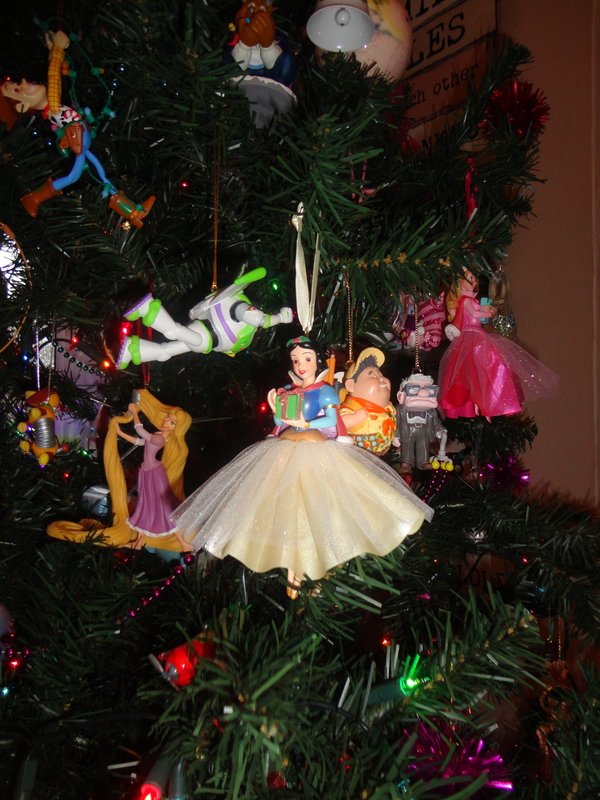 The Christmas tree is full… and I mean FULL… of Disney character ornaments, collected over the past years. 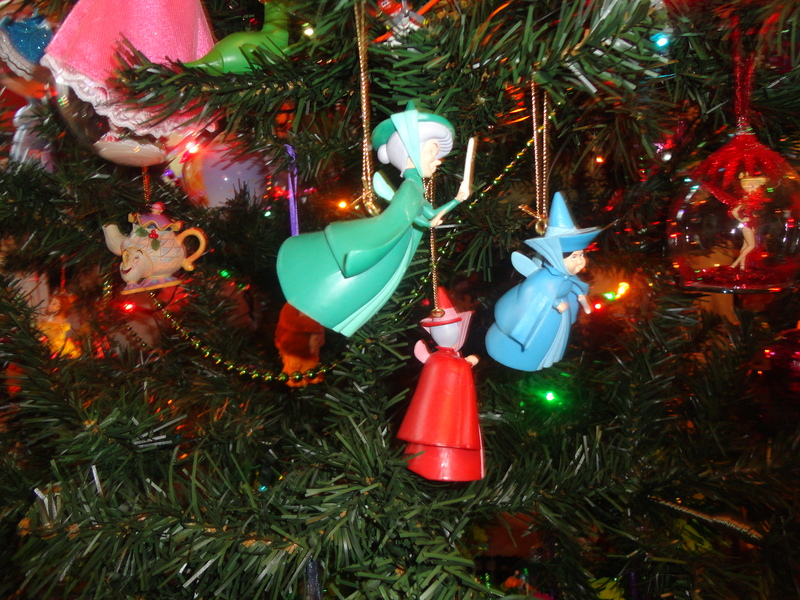 Family friends and relatives from far and near bring their kids to participate in a Disney Treasure hunt on our tree – with a prize to the one who can collect the most names. 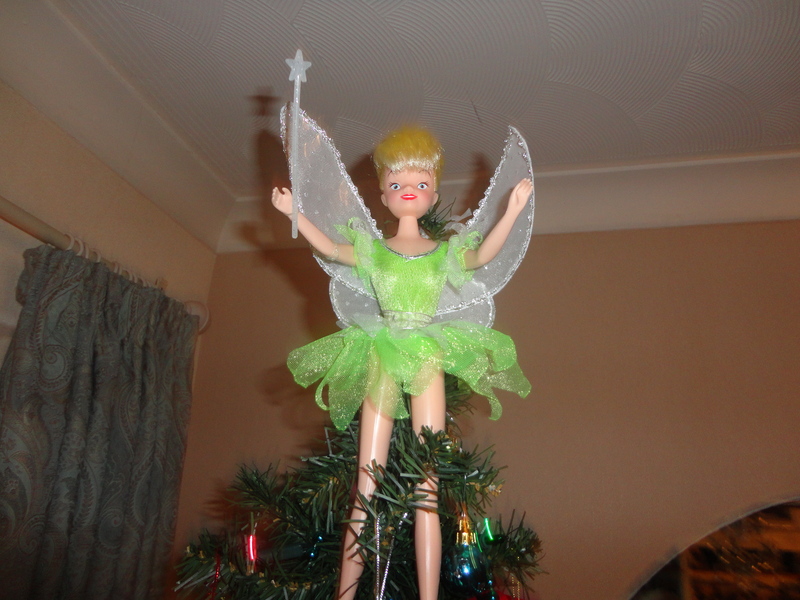 I always feel sorry for Tinkerbelle who has the most uncomfortable place of all to spend the Christmas period. ….and always without a word of complaint… OUCH! 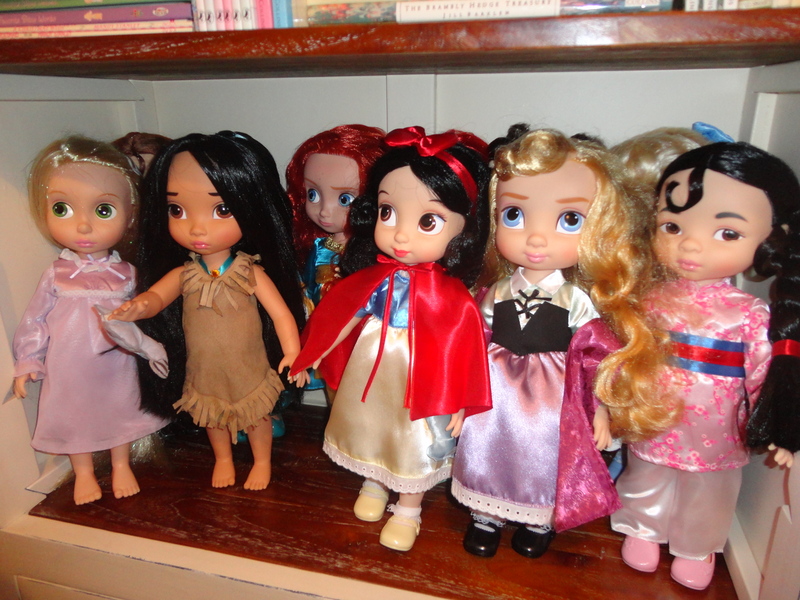 Last Christmas her collection of Disney baby princess dolls was lined up looking out of the front window. It looked a bit like a scene from the Rocky Horror Show but at least it kept the carol singers away! The Christmas before we were visited by the local rodent inspector, who had heard from the neighbours that we were infested with mice! 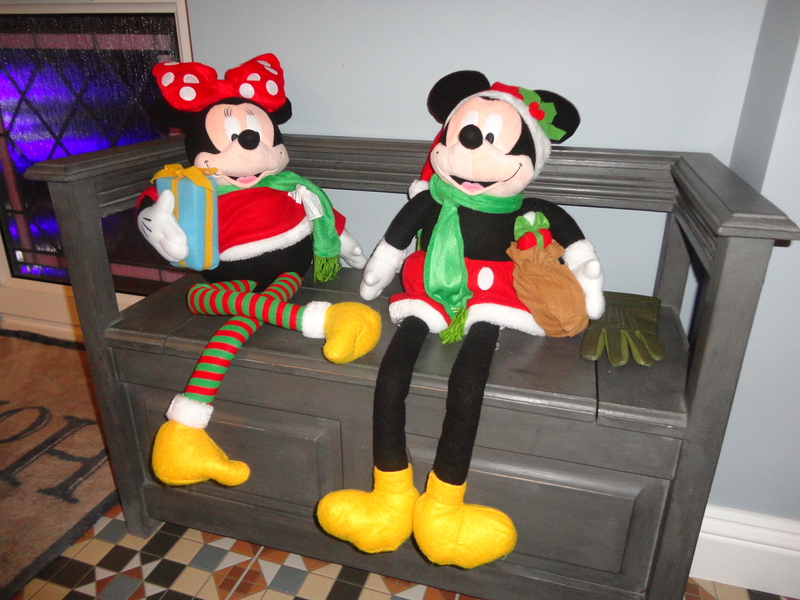 Mickey and Minnie were not too impressed! 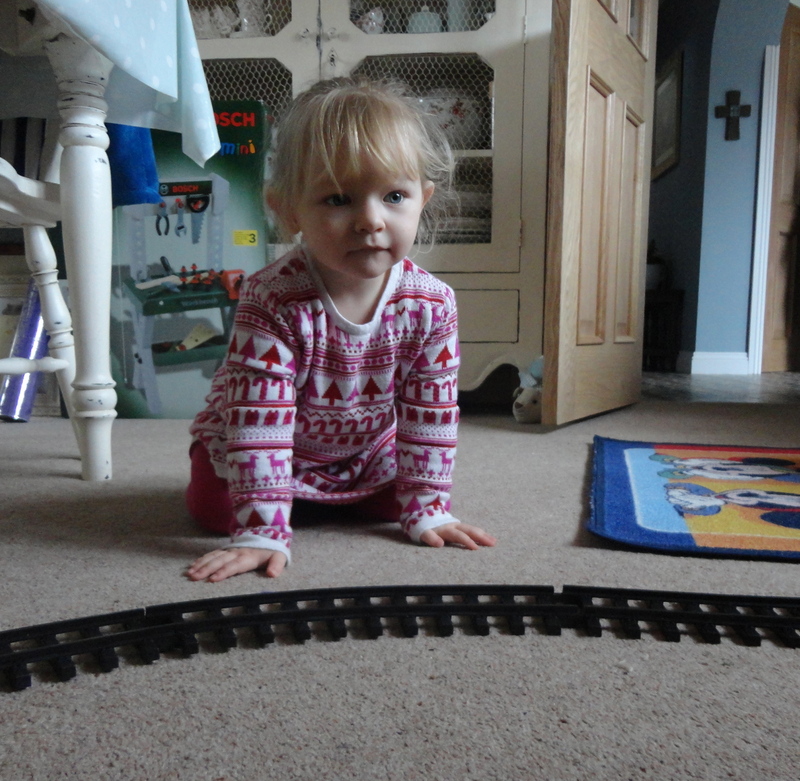 This morning we had a bit of trouble keeping the train on the tracks but the addition of a couple of straight tracks solved the problem. 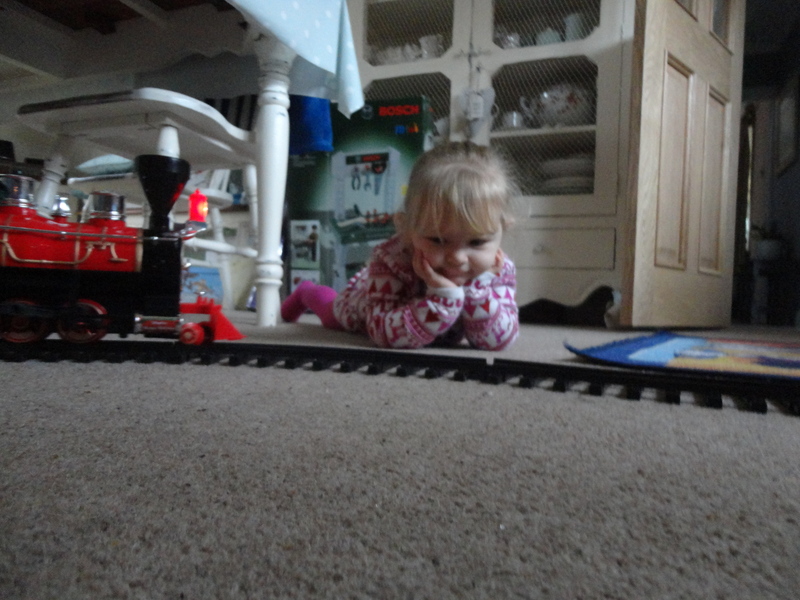 Millie especially adored the little train with its sounds and music. She especially loved the Disney carriage, which has Minnie dancing romantically with Mickey. She gazed longingly at it for a long time. So cute! Alfie succeeded in knocking the train off the track half a dozen times as he ran excitedly round it trying to jump over it when he needed to! Afterwards they spent some time checking out the characters. They were able to name and find loads of them. We were really impressed. 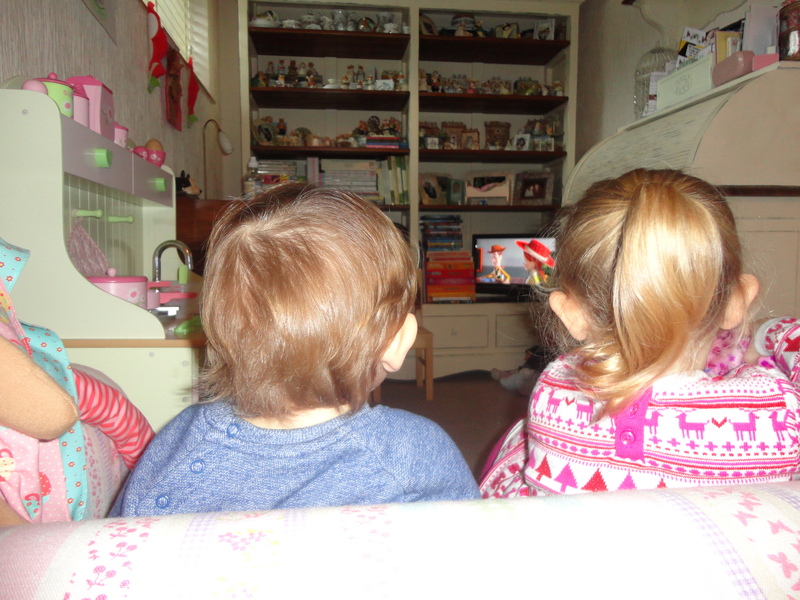 We had Toy Story playing in the background and soon they were sitting side by side on their very own settee watching the film with a snack. It’s not just old people who have elevenses – Millie and Alfie love having a mid morning snack. 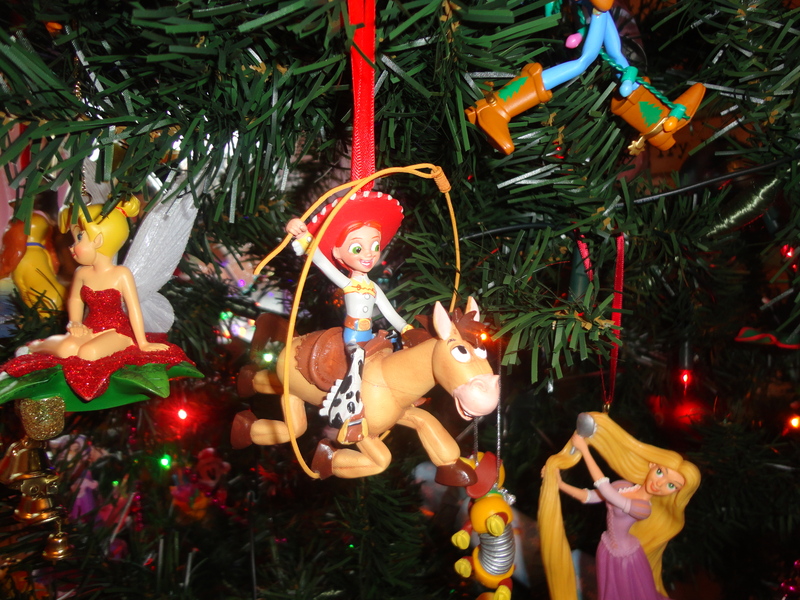 Toy Story is just one superb film; I love watching it too! One day soon they will be all grown up and will no doubt meeting in Starbucks. 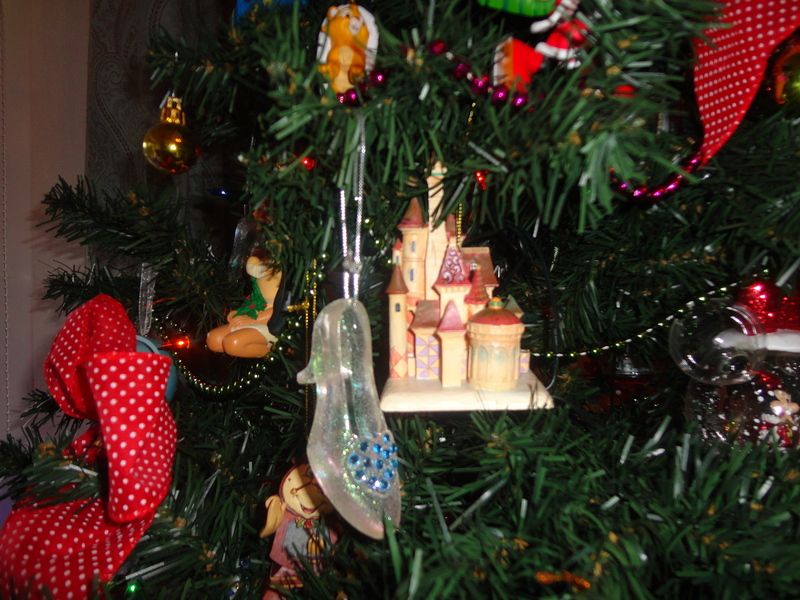 We hope they will remember our little house where their friendship was nurtured… such happy and special days. Later in the morning we sat down for a story. 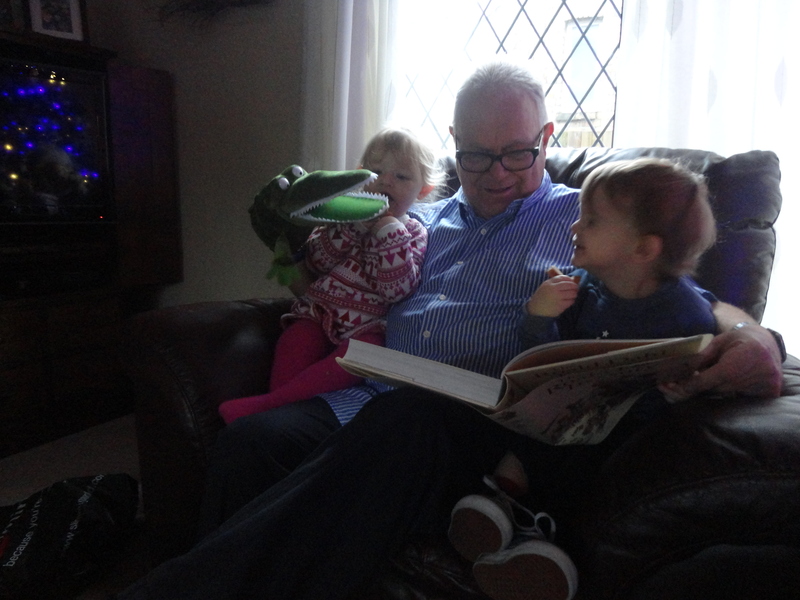 I have started training them to become Roald Dahl fans and today we read The Enormous Crocodile. It’s a great tale about an enormous crocodile that loves to eat fat. juicy children. 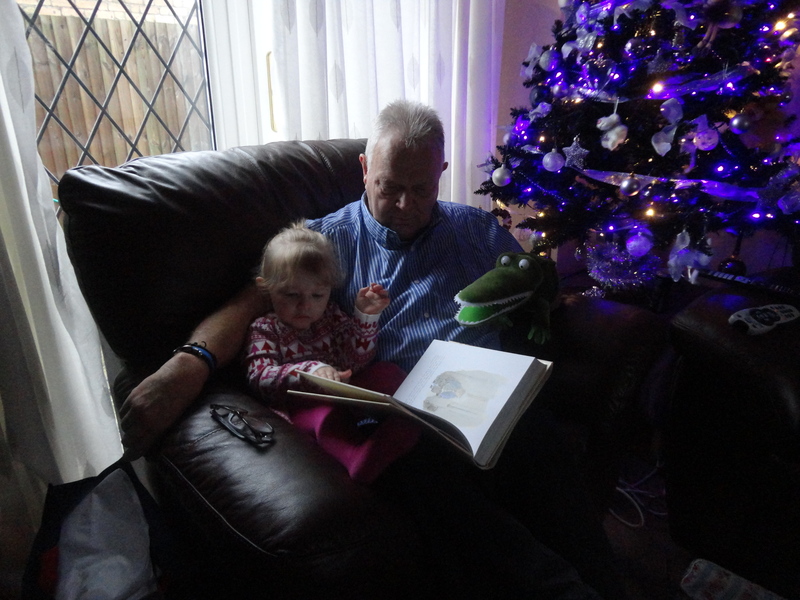 I am not too sure what Millie thought of my props, but they enjoyed the story… at least Millie did when the crocodile changed hands! 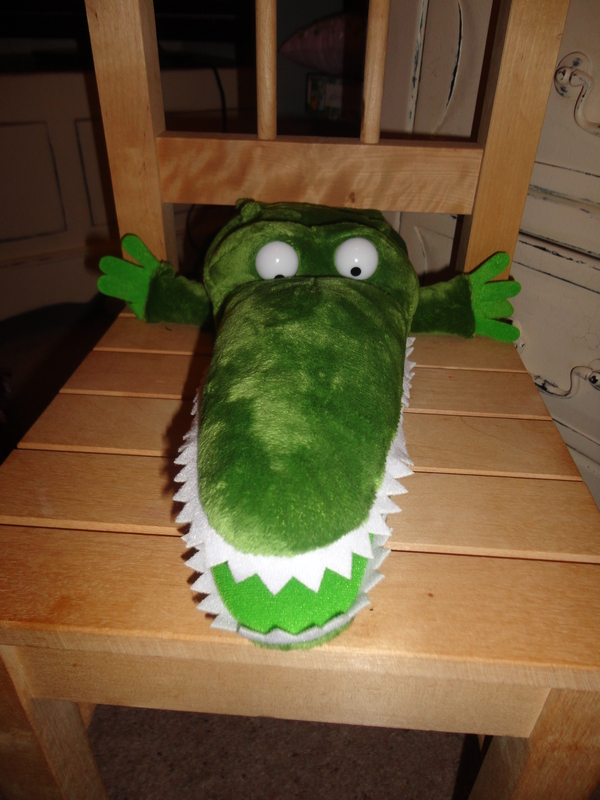 Alfie loved feeding the crocodile with toast, hoping I am sure to avoid being eaten himself. He’s a canny lad! It wasn’t long before our real life Princess Mia arrived at our house, her lessons for the day all over. 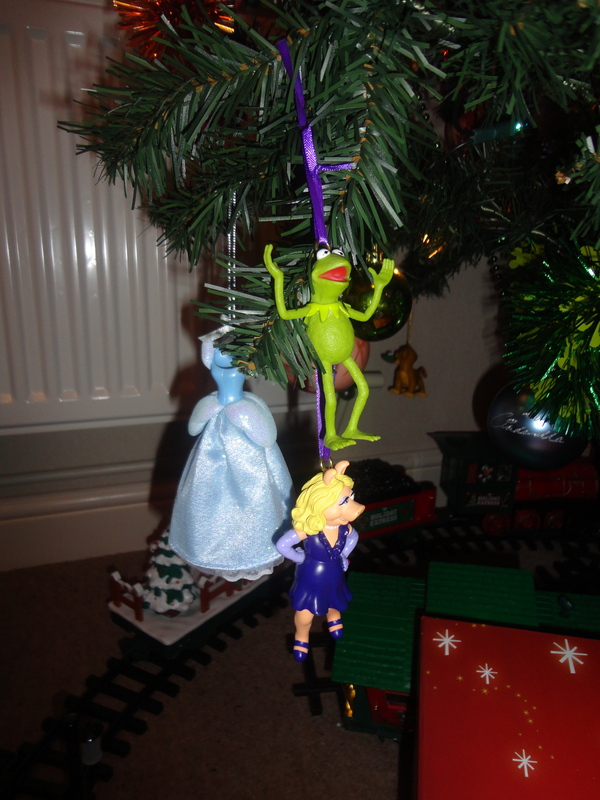 Millie and Alfie both cheered and clapped. 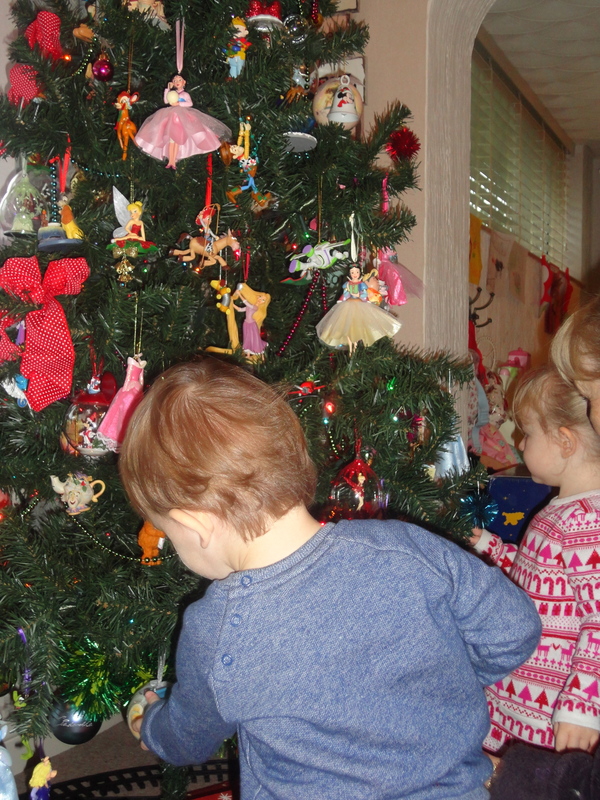 The three children played together happily before the girls had to leave to visit their grandma. When Millie’s mum arrived she had with her a huge Victoria Sponge for us – not quite Bruce Bogtrotter proportions but big enough for us to realise today’s diet would not last too long! 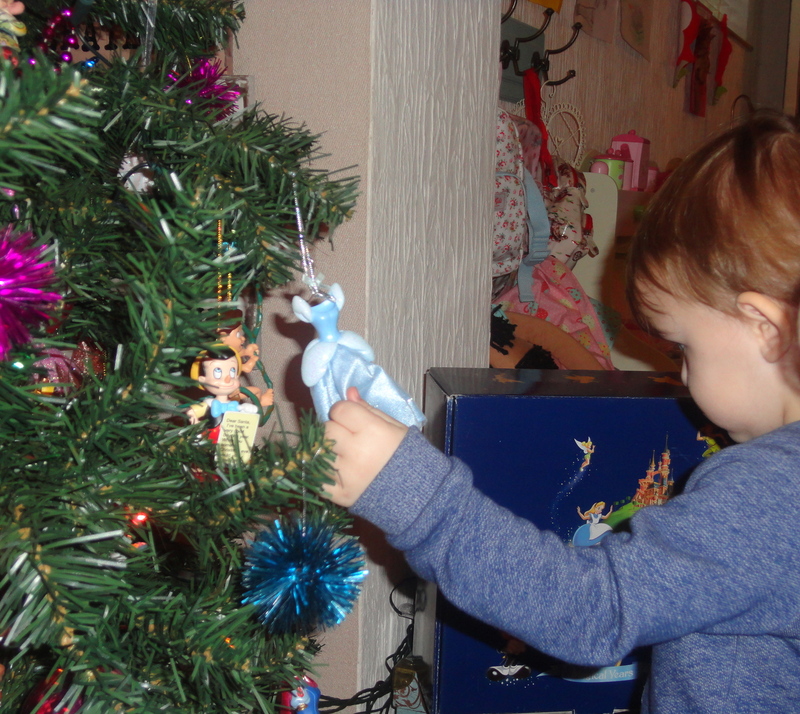 I loved it, the lady of the house loved it and so did Alfie! Mia loved playing with the enormous crocodile and I could see the enormous crocodile eyeing her up as a tasty snack as lunchtime was approaching. Luckily, being a princess, she had her magic wand with her, so she was able to keep the dreaded animal at bay. As she left she cast her spell on him so he cannot move until she returns. In a similar way these beautiful children cast their magic spell on us and enchant us every time they visit. Come back soon little ones! Mia, Alfie and Milie… you are loved! 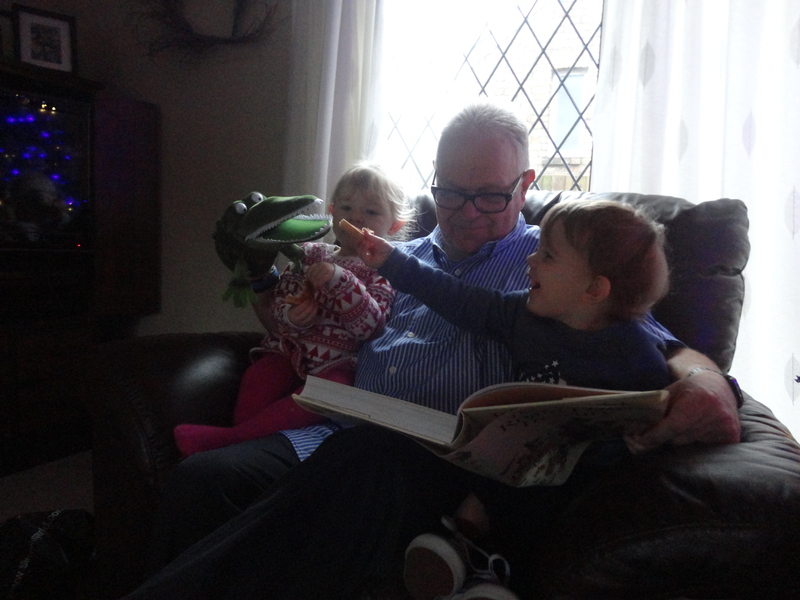 Previous PostAdvice to my grandchildren…Aim high!Next PostPerpetual sunshine produces a desert.